This peaceful, airy, two bedroom, two bath condominium at White Sands Village is across the street from one of the best boogie boarding and sunning beaches on the Big Island, five minutes from amazing snorkeling and sea turtle viewing at Kahalu'u, and only four miles from charming Kona town. The complex at White Sands Village is complete with swimming pool, Jacuzzi, unlimited FREE reservable tennis courts, three gas barbecues, and picture perfect sunsets. Located in the rear building, away from the noise of traffic, you can awaken every morning to the sound of tropical birds. The Big Island of Hawaii is unrivaled in its beauty, diversity of topography and climate, and Aloha charm. Dining, from fine to casual, is as close as a walk across the street to Jamiesons for fabulous seafood. Or, take a short trip into town where you can stroll, explore, shop, and enjoy a wide variety of restaurants. A bonus is the Kona Farmers Market where you can try the islands fresh fish, produce, coffee, and flowers. Prepared in your well-equipped kitchen, your meals become something very special on your 27-foot tiled lanai. This condominium is ten minutes from Kailua-Kona Village (shopping, entertainment, restaurants, and historic sites), 13 miles from the International Airport (KOA), two miles from the Kona Country Club golf course, and two miles to the Keahou Shopping Center which has multi-plex movie theaters, drug stores, supermarkets, boutiques, and restaurants. There is plenty to keep you busy and interested. Good location, condo well stocked, complex was quiet, and the beach across the street was fun. A great snorkeling beach just a mile south of the complex. Nice central location for all west side Big Island activities. Magic sands beach was right across the street. Washer and dryer in unit made it so convenient. Would stay again! We had a great trip and really enjoyed the big island. Unfortunately due to the time of year, the beach in front of WSV condos (Magic Sands Beach) wasn't suitable for swimming as the surf had not deposited the sand up on the beach yet. However, the locals and some strong swimmers in our group were able to swim there without incident. The Condo that we rented was outdated but was clean and comfortable. The pool, hot tub and common area with BBQ's, pool table and sauna was very nice as well as the grounds around the condo. The only thing I would change would be the tennis courts. In the 2 weeks we were there, they were used twice. Seemed like a waste of space that could be used for many different applications, ie: horseshoe pits, volleyball, another pool or even just a place to suntan on the grass. Overall we really enjoyed our stay and would recommend it to anyone. Aloha! A comfortable condo in a good location. We like to stay here. Comfortable condo in a good location. We like to stay here. Condo has 2 boogie boards, snorkeling gear, AC, blender and large lanai. The condo is well equipped with most of what you need and is very comfortable. Beach is easy walking distance away, right across the street, and a pool and hot tub on site. BBQ and tables near the pool. Everything has been set up so you have a great vacation! Just buy your food and your set. 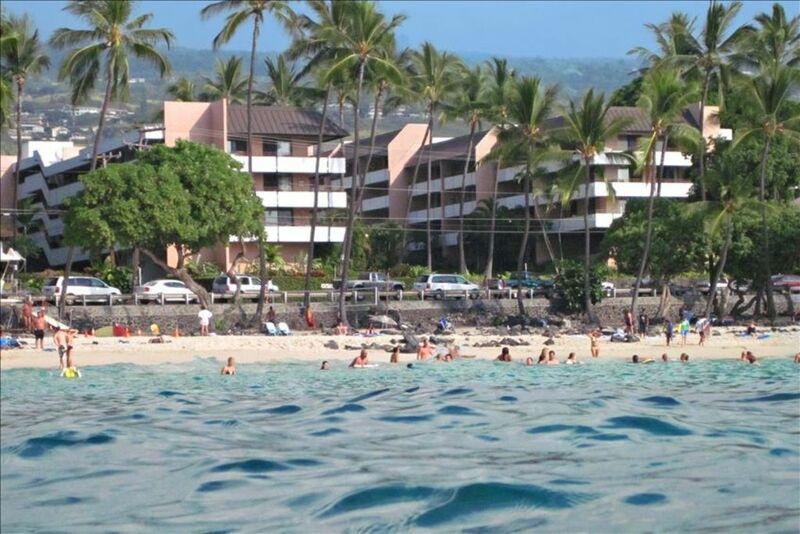 Condo is in a good location to see all the awesome things the Big Island has to offer. We really enjoyed our stay. The condo is well equipped. We hope to spend more time next year at this condo. Hope to see a safety bar in the walk-in shower, for us old folks.